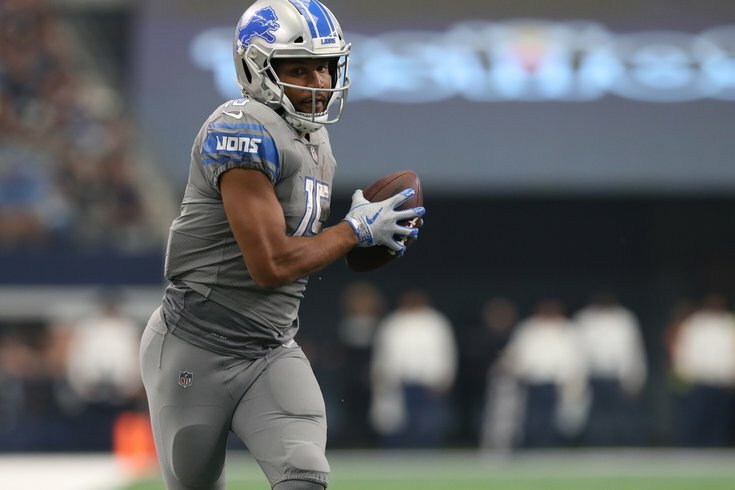 Golden Tate will likely be used as an extension of the running game in the Eagles' offense. • If you're taking the time to watch all of Tate's 2018 targets (or at least read about them), then you've already undoubtedly seen highlight reel videos of him. Tate is capable of big plays, because he is one of the best receivers in the NFL at making defenders miss once he has the ball in his hands. His ability to get yards after the catch is, by far, his best trait, which you likely already know. • The Eagles didn't trade for a running back at the trade deadline... or did they? Because that's essentially what Tate served as in Detroit's offense in many ways. On Monday, Jim Schwartz talked about how the running game in the NFL has crept into the passing game, and how you have to defend it. "There are so many layers to run defense now," he said. "A run can be called and it's still a pass. Advantage throws to outside, RPOs, and then pass plays can be called and they can still run it. Quarterback can scramble, read option type things. Our biggest thing here, and you know me, it's all about getting stops. It's all about keeping points off the board. If that means giving up a lot of rushing yards and not much passing yards, then hey, that's the way it goes. If it means the opposite, that's the way it goes. I mean, you know me, they don't give any more points for a rushing touchdown than they do a passing touchdown. It's our job to keep points off the board. However that happens, it happens. "I think probably the one thing I would say there, the passing game and the run game are melting together so much that it's not about taking one of them away. It's about limiting the offense, if that makes any sense." As you can see in the video, there are no shortage of quick throws to Tate that are little more than glorified run plays. While the Eagles didn't upgrade in a traditional sense at running back at the trade deadline, I believe they actually did in the form of Tate, only on the perimeter instead of between the tackles. How the Eagles use Tate won't look exactly the same as the way the Lions used him. The Eagles will utilize RPOs a hell of a lot more than the Lions did, for example, and easy ways to get the ball in Tate's hands through the air will allow him to use his yards after catch ability against defensive backs who don't tackle nearly as well as linebackers. • The Lions rarely took shots down the field to Tate. By my count, Stafford only threw more than 20 yards down the field (in the air) to Tate 2 times. • If the Eagles intend on using Tate similarly to the way the Lions did, it won't take long at all for him to learn the parts of the offense that apply to him, since again, so many of his routes are simple patterns near the line of scrimmage. • I was surprised by the number of drops by Tate. I counted 7. My perception was that he had very good hands, and maybe 2018 has just been a year in which he has more drops than normal, but he'll have to cut down on those and begin catching the ball more cleanly. • In 2018, Tate has caught 44 of his 69 targets, or 63.8 percent. On the season, Matthew Stafford is completing 67.8 percent of his throws. In theory, Tate's catch percentage should be up over 70 percent, considering the high number of easily completed passes he catches near the line of scrimmage. However, if you'll note, Tate is typically the receiver Stafford locates when he tries to throw the ball away, which artificially hurts Tate's catch rate stats. Tate is going to play right away, and he's going to have an immediate role in the Eagles' offense. To be determined if the Eagles try to find ways to get him more looks down the field than the Lions did this season, but in my view, Tate will be used more as an extension of the running game than he will as your typical No. 2 type of receiver, which is probably not how he should be labeled. After watching him, Tate is less of a traditional wide receiver, and more of a unique weapon that a creative offensive staff should be able to find ways to use effectively. We'll see if Doug Pederson and the gang can get the most out of Tate's talents.